Very classy and perfect for an event that calls for pearl earrings and necklace. Love having the sterling silver rather than the gold-plate too. Very happy with my purchase. 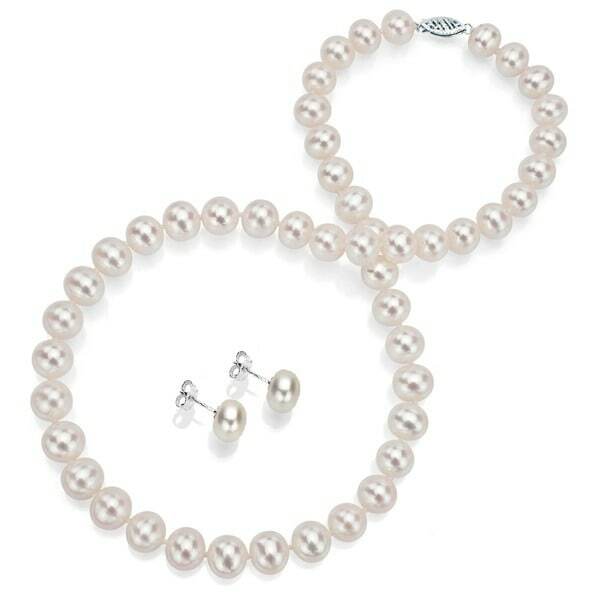 This jewelry set consists of an 18-inch white freshwater pearl strand, matching white freshwater pearl stud earrings. The necklace and earrings secure with sterling silver clasps. Dimensions 18.0 In. X 7.0 In. X 3.0 In. I received the pearls and earrings on 02/04/2011. My mother purchased these for me as a surprise gift to wear with my ball gown for my Debutante Cotillion on April 16, 2011. I was so pleased when I opened up the box. The pearls and earrings are beautiful. I can't wait for my big day to come so that I can wear them. Thanks Overstock for such a wonderful product. We will be ordering from your site on a regular basis from now on. After searching through hundreds of pearl necklaces on different sights I came across this one & knew it would be the perfect choice. The pearls have some nice weight to them, they are a lovely white color & are very well made. It was a huge bonus that it came in a set with the earrings every bit as beautiful as the necklace. And it also comes in a wonderful white gift box that makes for the perfect addition for presentation of this gift. My better half is going to fall in love with this set! I would buy from here again & recommend this seller any day! The quality of the DaVonna White Freshwater Pearls is good. However, the pearls are more oval than round. In addition, the pearls are stranded in the middle instead of the long side of the oval shape. If you do not mind that the pearls are not round, you will enjoy this earings and necklace set. I love this set and I recommend it to a friend that is in the processes of getting married. I told this would be a great gift for bridemaids and they could also wear at the wedding. I've had this set for nearly a year now and it's been good considering the price. I'm very pleased with the quality and look of the necklace, but the earrings are less than stellar. The pearls have held up fine, but the metal on the stud portion of the earring has had discoloration after significant use. Overall, I'm pleased with the set and it has fulfilled its intended use of adding some sophistication to my business attire! The pearl set that I purchased from Overstock was a Christmas present to my mother. I had no idea what to get her this year and after shopping through various websites to try to come up with a decision, Overstock provided me some pretty good choices. This is the choice that I finally decided upon. They were elegant and they also offered a jewelry box with which my Mom could put other jewelry inside. Perfect gift! She was more than pleased when I presented it to her. Thanks Overstock for helping me in my decision! These were purchased as a gift and I was more than satisfied with such a lovely wooden case and the good sized and quality of the pearls, necklace and earrings set. I was very excited to give this set as a gift. The first set came, and it looked great for the price - until one of the earrings fell apart after 7 days of use. I exchanged this set for a new one - only to have one of the earrings in the new set fall apart after 2 days. I would not recommend this product for ANYONE - it is unfortunate the quality is so poor for such a nice looking product. Purchased this set for my administrative assistant for Christmas. She absolutely loved it -- couldn't say enough good things about the pearls and the jewelry box. Thank you, Overstock! the necklace is poor quality, the sizes of the pearls are disproportionate, and not arranged well, i wont recomend it. The Best Pearl Set EVER! 5 STARS! If your looking at this set for yourself or as a gift then dont hesitate; I give you my word you will be 100% pleased. This is my second set for my second daughter's wedding. My 1st daughter was so pleased and wears hers a lot. I have No doubt my precious 2nd daughter will be thrilled with these.You will too. This is a beautiful necklace and earring set. If you are contemplating purchasing this set, just buy it! I am so happy I did. Another great purchase from Overstock.com! My sister was In love with this gift I got her she is very happy and pleased with it. Purchased these as bridesmaids gifts for my sisters and was very happy with the quality! Beautiful, I bought at least 10 as gifts for bridesmaids. The set was just beautiful. "are these pearls Individually knotted ?" Yes. These pearls are individually knotted.